July 2014: World Cup Winning Reads! 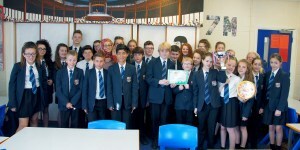 Mrs Issa’s form 7M were the worthy winners of the inter form Year 7 ‘World Cup Winning Reads’ competition! Between them, they read an astonishing 106 books last half term to propel them to victory. The group, quite coincidentally, were also representing Germany, who went on to win the real thing! Special mentions should be given to the winning boy and girl in the form who helped them along towards the glittering trophy and amazing prizes. Neve Hargreaves contributed by reading a whopping 26 books and Joseph Caldwell read 11. Both were given some extra goodies for their hard work and effort. It was wonderful to see the students so enthusiastic about reading!